Hi. It's been a bit quiet around the blog lately....lots of crickets chirping, I know. First I was really, really tired. Then things got really, really busy. Then I got really, really tired again. Then the kids all got sick and were running triple digit fevers as of last night. So while someone's at home with them, I'm at Starbucks clutching a hot black tea with loads of milk while cold air whips around me every time someone opens the door. It's 27 degrees outside in Texas, y'all. Holy frostbite. This past week has been a good one for a couple reasons—including a special visit from a dear friend—and the husband finally got home after hunting in Kansas for the better part of a week. I'm on my own with the quads more and more these days, which tends to just leave me that much more worn out. And while I'm not complaining about it, I'm still adjusting to the increased level of tired and finding the best ways to cope. We've also been taking more outings, just the five of us. Which is huge for me! I used to become paralyzed with fear at the thought of taking my crew out alone. But it's like a switch turned on a couple months ago and now we tackle Target, the grocery store, the park and more without hardly a worry. 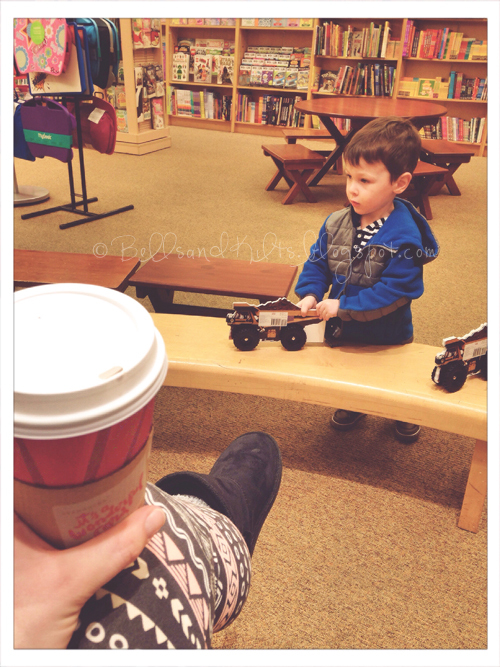 The kids are so well-behaved in public, too, and enjoy getting out of the house as much as I do. Next week, we'll be attempting the kid's club at my gym for the first time and I'm hoping this goes well as I could really use a regular workout schedule again. 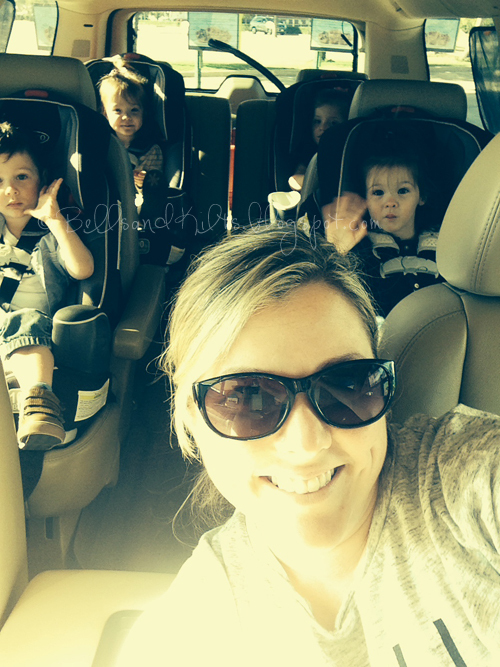 And in more big news, the quads started Mother's Day Out! If you're not familiar with the moniker, it's basically like a daycare/pre-school combo and we attend the one at our church, which is wonderful. Mondays are all-new in our house as they go every Monday 8:45am to 2:15pm and I both drop them off and pick them up by myself. It's been such a blessing, especially since our wonderful nanny no longer is able to help us out during the week. Just when I started to worry about how I'd survive five straight days with little help, all our parents have continued to be very present when needed and then the MDO program presented itself and they just happened to have several openings in the Monday class and BOOM! We were enrolled. The kids have only been twice and the second time they entered the class room voluntarily and cried for less than two minutes. Yes!!! 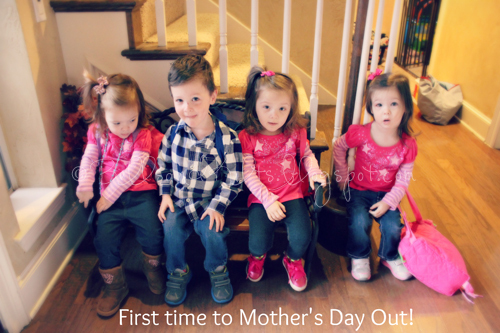 picking them up from their second day at MDO! In addition to having my Monday mornings all to myself—which, inevitably, end up being filled with errands, a trip to the gym, projects at home, or hours working at Starbucks—the kids received glowing feedback from their MDO teacher. She asked if I'd been working with them at home thus far, because they really knew their numbers, colors and letters and added they were very receptive, kind, smart and very well behaved. I was SUCH a proud momma!!! 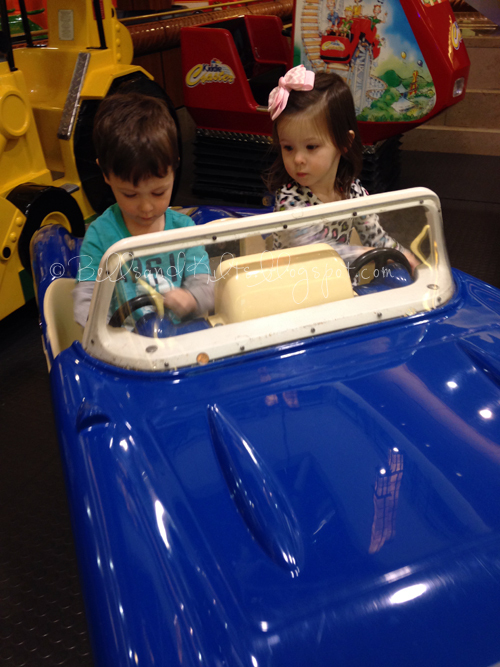 Speaking of good behavior, my mom and I took the kids to our nearby mall recently for the whole evening and they were exceptional. Time at the kid's play area, quarter rides, bouncing on the inflatable wave at the surf shop and dinner in the food court (below). 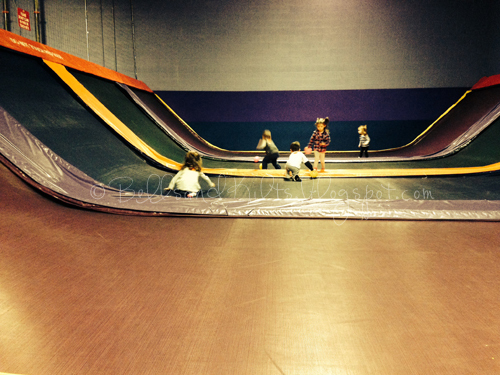 And more recently, was a trip to the local Jumpstreet laden with bounce-inducing trampolines—including a toddler area! 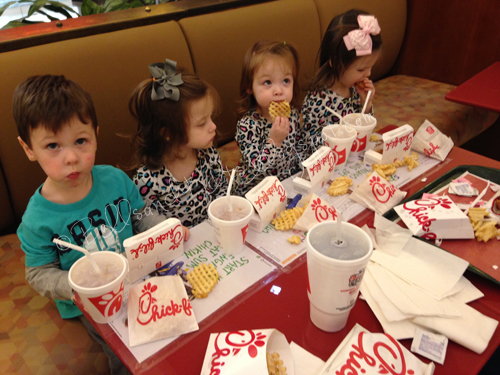 A huge success and we will definitely return...kids 3 and under are only $4! I hope you have plans for a great weekend and I hope to be back soon with more posts!! Haha! It's crazy to be in the 20sF in Texas - more surprising that we're currently colder than parts of Canada! Though I know your winters far surpass ours! Guess it is to cold for the crickets a post yea!! Just reading all your doings makes me tired, hope the kids are feeling better and you dont come down with whatever. Cannot believe how big they are getting, and so damn cute. Tomorrow starts Deer Hunting season here in Mo, a lot of guys are heading out what does your hubby hunt? He was out hunting pheasant on this trip! I'm always exhausted after reading about all your activities! :) I think it's just awesome that you now have the MDO for them and for you. They're growing leaps & bounds and yes, they seem extremely well behaved. Kudos to wonderful parents! I always enjoy seeing the videos your mom shares. You are like SUPER Mom! Haha, I have 2 boys (just a year apart) and I though my life could get hectic! Admiring all you do with (and for) your precious munchkins! Love your blog! Are you going to do another post soon? Love it. Glad to hear they're going to MDO and y'all get a break from each other.